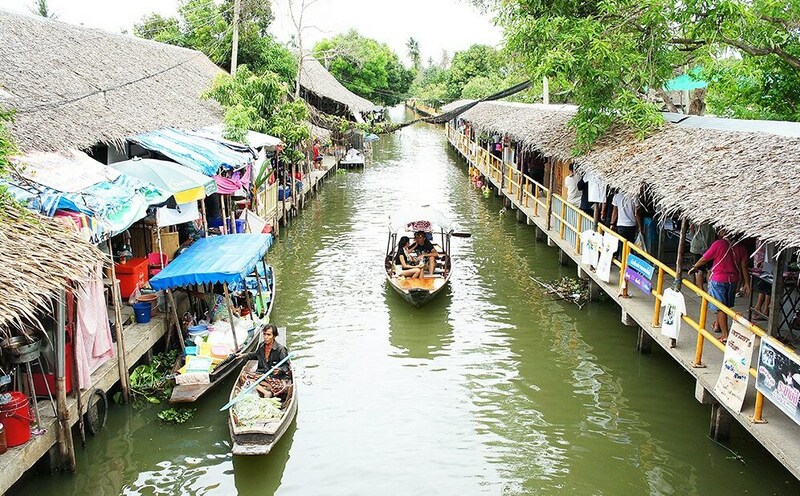 There are many floating markets around Thailand. I enjoy being by the water so I have visited to many of them. 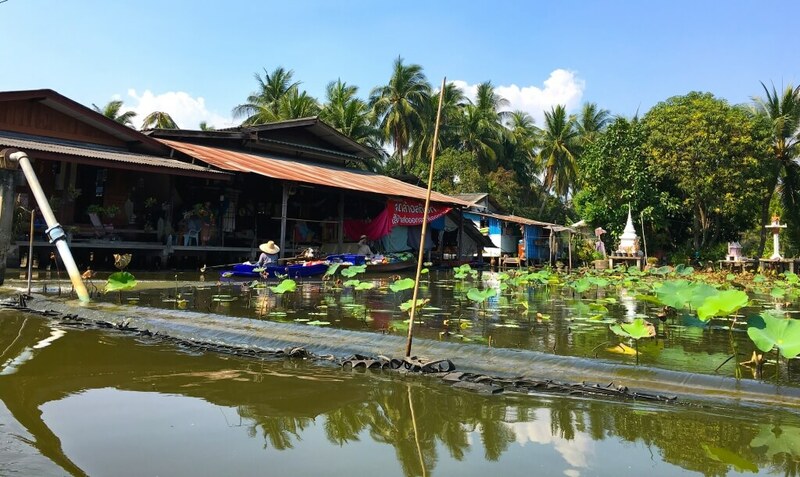 Most of the nice floating markets are outside Bangkok which is too far for a day trip. 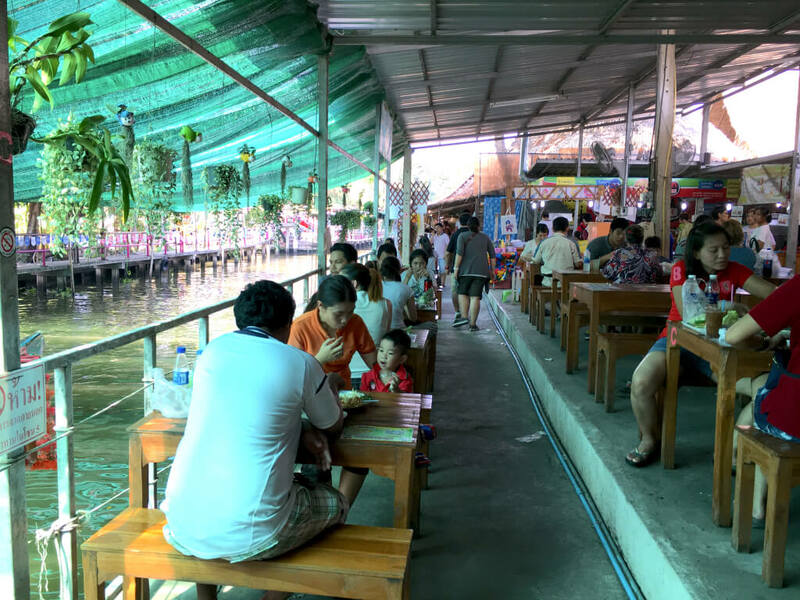 I was happy to find Khlong Lat Mayom Floating Market (ตลาดน้ำคลองลัดมะยม), which is less known than the heavily touristy floating markets such as Damnoen Saduak or Amphawa, but I prefer this place. Klong Lat Mayom market is set along a narrow canal with a more authentic feel, albeit most of the vendors and eating areas are on the land. I also like that they don’t focus on tourist goods or souvenirs as most for the visitors are local Thai people. I love these bamboo seating. 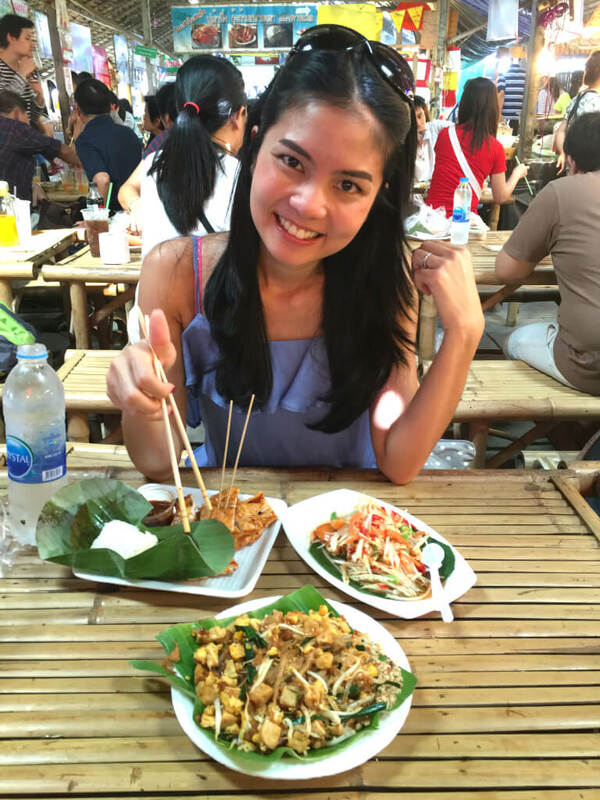 I decided to go for grilled chicken, Som Tam (Spicy Papaya Salad), and Pad Thai. I love this lady for dressing up in traditional Thai outfit and making one of my favourite childhood desserts. I saw many people were lining up in front of this Thai dessert stall, so I bought one to try. It was so good! 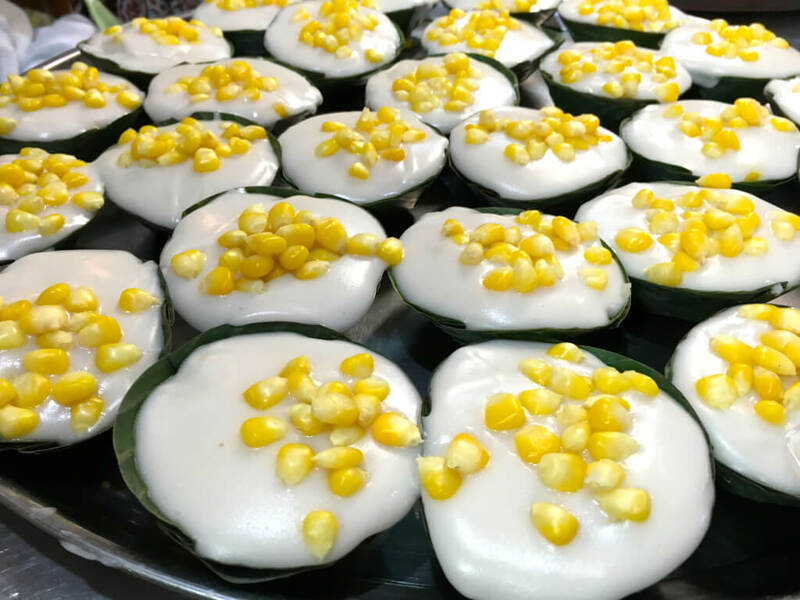 This is called Khanom Tako ขนมตะโก้ /kà-nŏm dtà-gôo/. It is Thai Jelly with Coconut Topping. 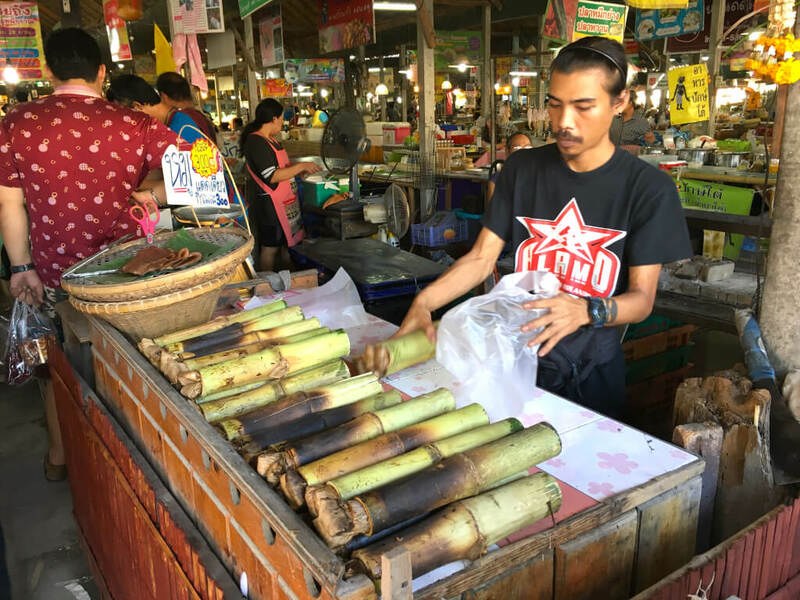 Grilled Sticky Rice in a Bamboo Tube, in Thai is called ‘Khao Lam’ ข้าวหลาม /kâao lăam/. Before going home, I bought some vegetable and fruit from these two lovely ladies. When visiting these markets you should not miss taking a boat ride to observe the traditional housing and way of life along the canals. 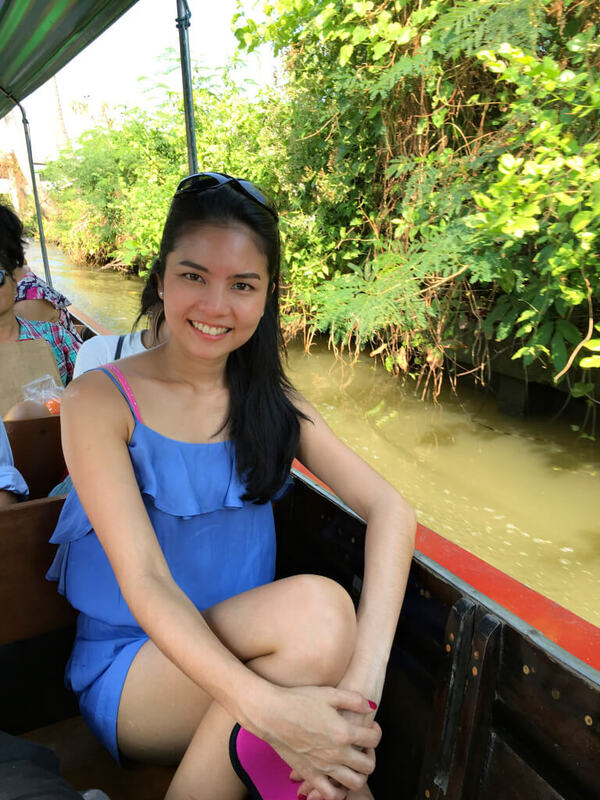 The boat trip takes about one hour and you can enjoy the view along the canal, experiencing a very different kind of Thailand than taking tours inside the big cities. 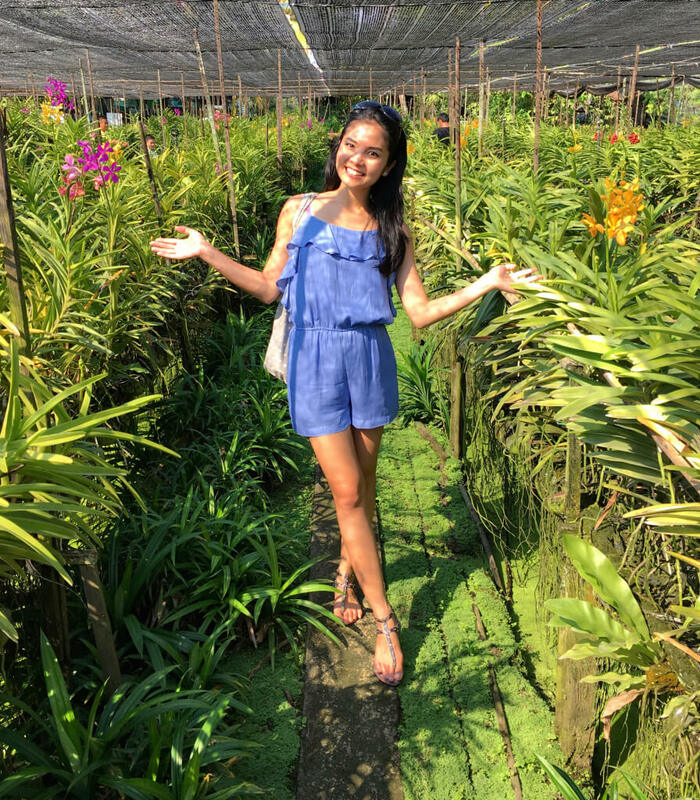 On the boat tour you get the choice of getting off at 1) a homestay and walking through a plantation or 2) going to a temple and an orchid farm for 20 minutes for each stop. The price is very reasonable – 60 Baht for Thai adult and 100 Baht for foreigner. (I am sorry I didn’t notice the rates for children.) You can also hire a boat for yourself for 1,000 Baht. There is also an option to take a smaller boat with no engine to explore Latmayon Canal for only 20Baht per person, I chose this option when I first visit the market. This time I decided to go with the long-tailed boat tour for a change, it was enjoyable as well. 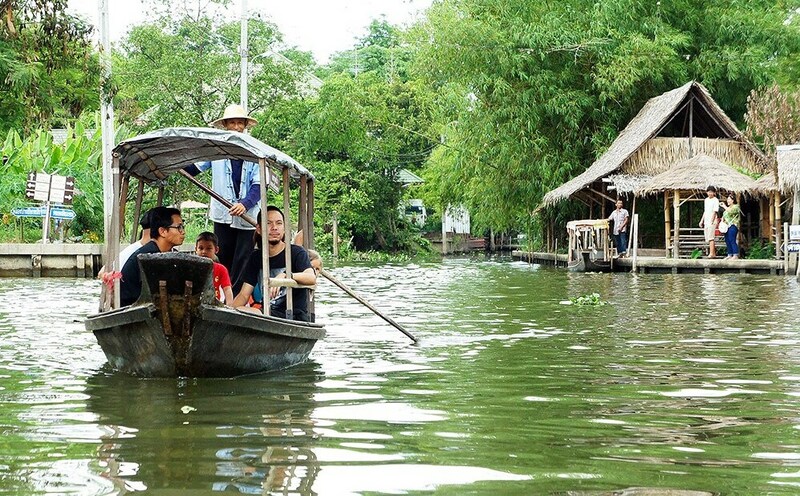 The boat ride allows you to observe the real way of life of people living by the water. 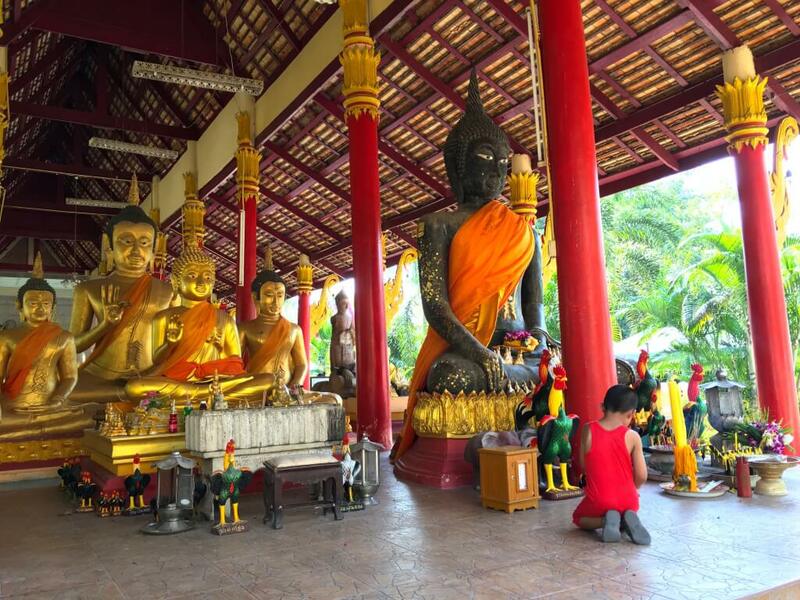 The boat tour let us stop at a local temple to worship the Buddha images. 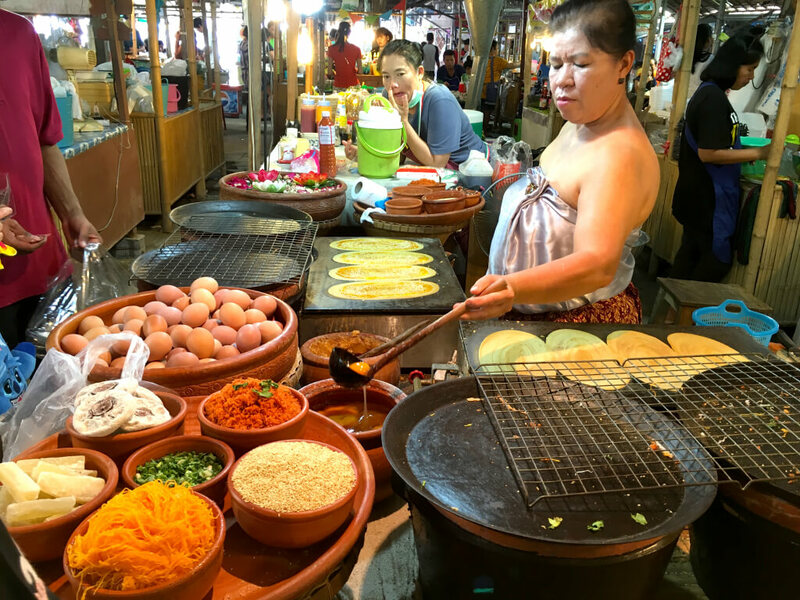 Klong Lat Mayom is a weekend market on Saturdays and Sundays from 9:30 am to 4:30 pm. I would suggest arriving for opening time, as it gets pretty busy around lunch time. 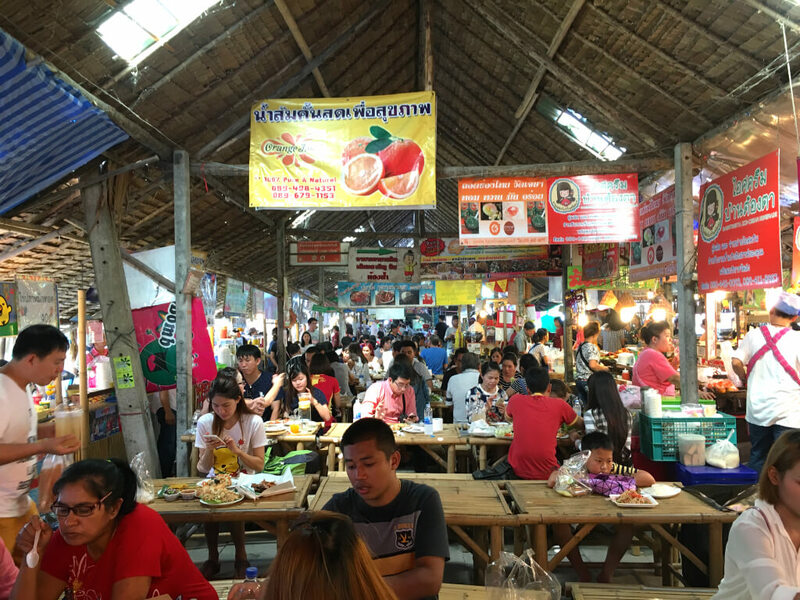 The market is located on Bang Lamad Road off the Bang Khae-Bang Bua Thong Outer Ring Highway, Taling Chan, Thonburi. Using the BTS Sky Train, take the Silom Line and get off at Bang Wa Station. From there get a taxi (approximately 100 baht). Thank you so much for this post !! I’m french, 18 years old and I’ll go to Thailand for 1 month in August so I was looking for good places in Bangkok !! khru Mod, can you give the the exact location on google map so I can show the taxi driver? Thanks!! After red your post about the view of floating market so, I saw many places that very nice view and wanna to visit there. chopsticks upside down ?.Just curious. Sawatdii ka Jim, thank you for your kind comment. Wow, very nice. definitely worth a visit and not so touristy right? Even though it’s only a small discrepancy I still hate the way Thais want to charge foreigners more. If we did that to foreigners here in the UK there would be outrage. 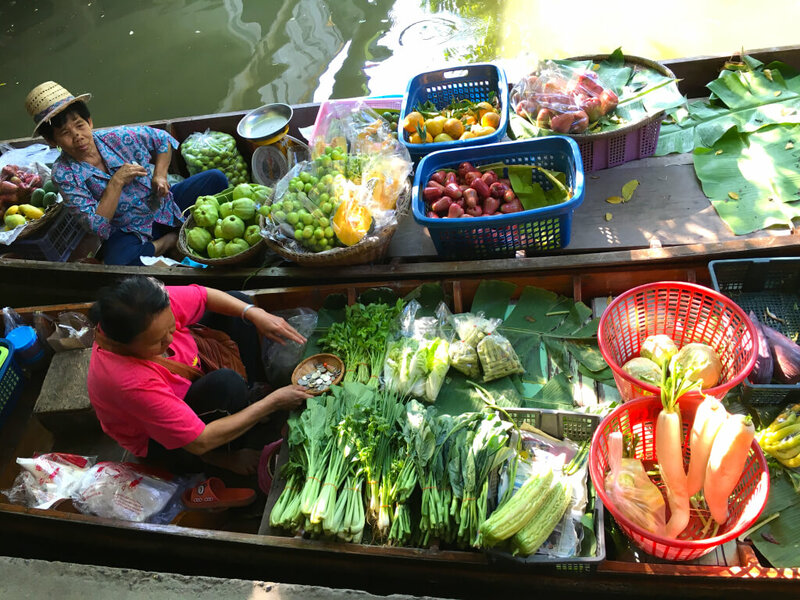 It’s amazing the way Thais sell vegetables from their boats. How do the manage to end up on boats anyway? Are they brought from farms up river or something or are they loaded onto the boats to sell? It would seem to make more sense selling from dry land. That lady in the picture must be very agile to be able to reach those white radish without falling out of the boat! I am not sure where the sellers get their vegetables, but many people in this community live by the canal where there is no road so the boat is their means of their transportation and making a living. This is the one thing we did not do when we were in Thailand. Next time we will visit one of the floating markets. Thank you for this information Mod! Very well done. 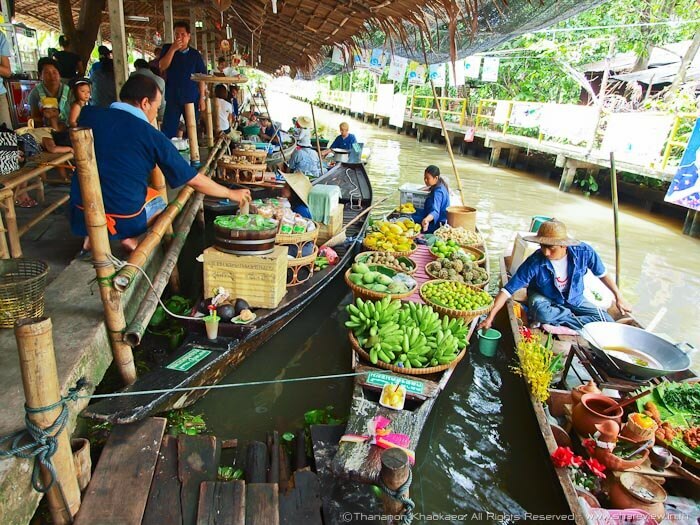 We will be going to a floating market when we visit next month. Dum Nern Duok (?) I believe. 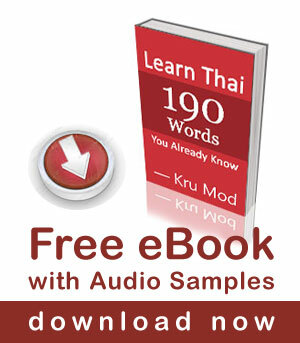 Thank you for the learning Thai lessons. thanxs for the idea , the beautiful pics and reportage. Looks like a fantastic place ! Thank you for the recommendation. The wife and I frequent the Kwan-Riam floating market off of northern Ramkamhaeng Road. It’s about a 30 minute drive from our condo, and easily accessible via the A-Link and taxi. I do t remember any fee, but it may have. Less authentic, more commercialized, but less frequently visited by farangs, myself excluded. Very family oriented with a small petting zoo and pony rides for the kids, and still a great assortment of foods, boat rides, shows, music, and lots of shopping. You should visit. Still in central BKK. 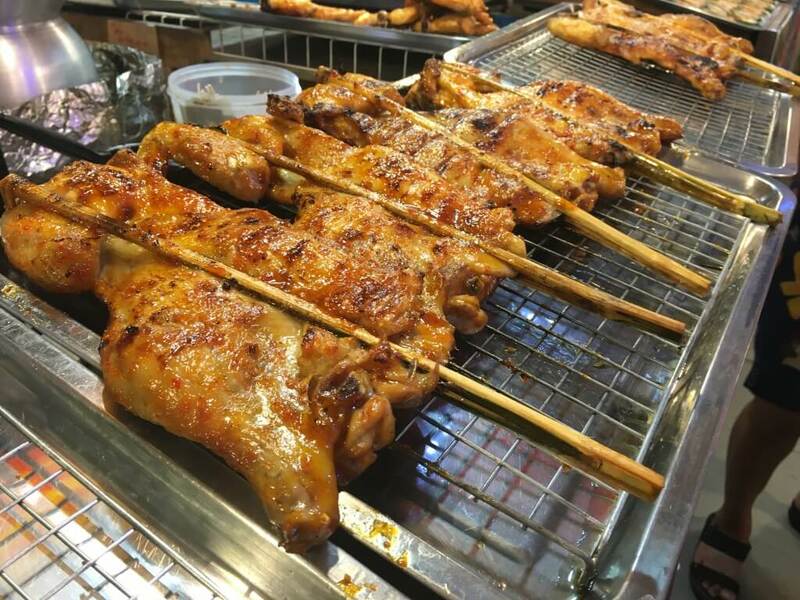 You are such a Lovely Representative of Thailand – I have 16 Years here and YOU still show me things I love to learn about every time you post .. you are a good Teacher, Khun Mod ..
Mmmmm Thai grilled chicken best in world, mmmm som tam and pad thai or kaao farang for the farang. Now I have a black Kaao Laam craving. Nice article. Thanks. Thanks so much for this post, and the photos that you included, Great info. Thanks and Take Care. Mick, Sydney. And if we take taxi what we will tell to the driver? I also took a taxi there. I fist told the driver to go to Bang Lamad Road, he wasn’t sure where it was so I showed him the Google map. You can tell him that it is off Bang Khae-Bang Bua Thong Outer Ring Highway.